I have to admit that my ongoing attempts to conquer Spanish wines (one of my New Year's Wine Resolutions) has taken on a "tilting at windmills" feeling as I grimly set out to find Spanish wines, then cleared off the kitchen table and sat there, with just my bottle and wineglass, so as not to have any distraction while I tasted the wine. Recently, though, I discovered that Spanish wines are not the enemy. Here's how. I subscribed to Catavino's feed in my reader, and started learning from the informative posts about Iberian wines. I listened to Tim Elliott's Winecast that featured Ryan Opaz. I started understanding what was on the label a little bit better, and how some familiar varieties like tempranillo and mourvedre might be masquerading under names like Cencibel and Monastrell (and most importantly, I learned these are not vineyard designations!) In short, I've started relaxing a bit, and considered it a personal triumph when, at a restaurant last week, I looked down the wine list, saw a tempranillo, and ordered it instead of my default shiraz to go with some gooey mac and cheese and a side order of grilled asparagus topped with honey vinaigrette and shaved manchego cheese. I find that Spanish wine is actually very conducive to relaxing (and my tongue is only slightly in my cheek here!). The wines I've been drinking have had a laid-back, comfortable feeling. They go wonderfully with food. And they represent exceptional value. What's not to like? My most recent Spanish wine find was the very good QPR 2003 Pago Florentino Tinto ($14.95, Chronicle Wine Cellar), complete with a little picture of Don Quixote on the label. This was a juicy, fruit-forward tempranillo that was dark, dark plum. Enticing aromas of berries and spice drew my nose into the glass. Flavors of blueberries and cedar predominated, and there were some leathery notes that added complexity to what was a friendly and straightforward wine. Tempranillo grapes characteristically have low acidity which leads to a plush feeling when you're drinking, despite the fact that this wine had a considerable influence of oak (8 months in a mix of French and American oak barrels), which produced the cedary, woody flavors. Last time I tried a tempranillo Ryan suggested pairing it with lamb, so we had this wine with a Food & Wine Magazine recipe for Lamb Meatballs sauced with tomatoes, cumin, and mint. Served over some steamed rice it was, as he promised, a perfect pairing. If this is the life of La Mancha, I'll take it. We took a seminar on Spanish wines from Doug Frost last fall. It was eye opening for us, and we've been chasing Spanish wines ever since. We love the value that is $5.99/bottle Vina Borgia and we just bought a case of the 2005 Tres Picos, which was excellent in 2004 as well. (They've told us to let the 2005 sit for a couple of months still.) We're constantly finding amazing values and quality in Spanish wine. In the seminar, we recieved a free book (half incredibly useful, half promotional) about Spanish wines. It was sponsored by www.winesfromspain.com, which has a lot of great information. I too have had a bottle of the Pago Florentino Tinto, and have another yet to drink, and must agree with your assessment, it is very good, and a superb value. Welcome, Carter. Lucky your to have a second bottle! As always, I am so glad to get feedback from readers when they like (or even don't like!) a wine I've recommended. We've all got different palates, so it's good to know that ours are in sync. Hope to see you back here in the future. Thanks for the nice write up! I'm glad to see someone is learning from what we've been doing, and I hope we continue to help you and others. 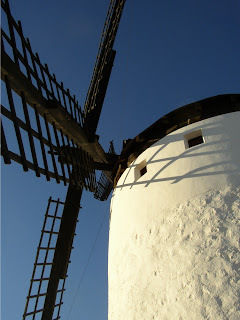 I know we turn to many blogs outside of Iberia for information on other wines, and I have to say, they tend to have better information as a whole than the wine rags I used to read! Welcome back, Ryan. I'm learning a lot from Catavino, and yes, the coverage is MUCH better. Thanks for helping me on my great Iberian adventure. Unfortunately, the Pago Florentino is not available locally. However, I have been an enthusiastic buyer of Spanish wines. While our tasting group is doing Aussie Shiraz tomorrow, April is tempranillo month. Will let you know how it goes. Cheers! Looking forward to the shiraz (serious syrah addiction here!) and the tempranillo note to come. Sorry the Pago Florentino isn't available near you, but maybe in the future? I just had a bottle of the 2004 that was recommended by the lovely people at Silver Lake Wine for just under your price limit and I will definitely buy some more. I have been trying Spanish wines lately and I would say this is definitely the most accessible I've had. There was much less earthy, leathery flavor cluttering up the fruit. Welcome, Boydn. Good to know that the 2004 is consistent with the 2003, and that a local merchant has it. 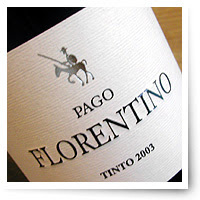 I think that Pago Florentino is a winery that is trying to appeal to New World palates. It may not appeal to those who like the Old World style--but I liked it, too.